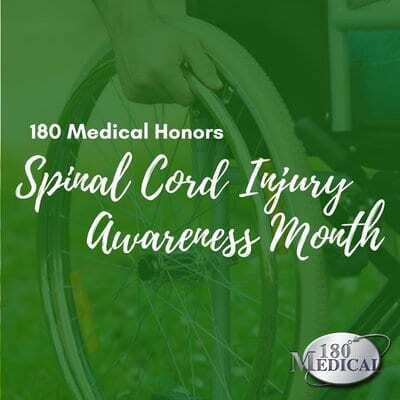 This is our second year at 180 Medical to set aside a special day to honor all those living with spinal cord injuries, including many of our patients, family, and friends, as well as our founder Todd Brown. We like to take time to do what we can to raise awareness about spinal cord injuries both in and outside of work, and our Spinal Cord Injury Awareness Day gave our employees an opportunity to not only help raise funds to directly benefit people living with spinal cord injuries but also experience firsthand what it’s like to maneuver around the workplace in a wheelchair. We all made it a point to wear green on SCI Day. Some of us wore green t-shirts or cardigans, even green pants and glasses frames, and others went all the way and wore as much green as they could! One of our employees even dyed his beard green for the day. We felt that wearing green, which is the official color for Spinal Cord Injury Awareness, would be a great way to show our support and join in solidarity as a group for the cause. Part of the fun of SCI Day was our lunchtime fundraiser, which was held at both our warehouse and our main headquarters locations here in Oklahoma City. Everyone enjoyed a few slices of pizza and brownies, and it was even more delicious knowing we were raising funds for a great cause. 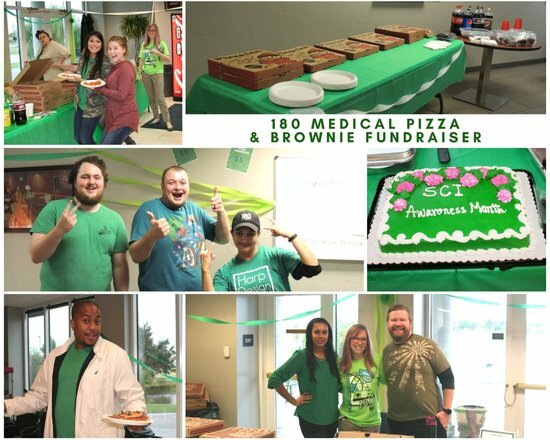 Together, as a company, all employees were given the opportunity to vote which organization we want to support with this year’s SCI Day Pizza & Brownie Fundraiser. We were excited to find out that by the end of the day, we had raised over $500, which will directly go to benefit people with spinal cord injuries at the organization, Will2Walk. As part of our Spinal Cord Injury Awareness Day, we wanted to give our employees a chance to take the Wheelchair Challenge and spend time during the day in a manual wheelchair. Since our company specializes in intermittent catheters and related urological supplies, along with ostomy supplies, we interact regularly with many customers who live with spinal cord injuries and use catheters daily. We truly care about each of our customers as if they were a part of our 180 family, and it’s important for us to take time to know as much as we can about spinal cord injuries as well as the challenges that those living with SCI face on a regular basis. Even though our employees were only able to get a half hour of maneuvering around in a wheelchair to make sure everyone who signed up had a chance, the impact it made was clear! Every person learned something from their experience. Some of the biggest challenges that our many participants discovered were getting in and out of the handicapped stall in the bathroom, holding and carrying food and drinks, trying to get items from shelves, getting on and off the elevator, maneuvering through doorways, and going any place outside, especially uphill ramps and inclines. There were many challenges that some told us they had never considered before, like opening a refrigerator door and getting items out or even going to the restroom. I have full advantage of what appears to be the simplest tasks, like reaching the top shelves in the break room, using the stairs, walking across the sidewalk without running into things. I feel truly honored to work for a company that takes the extra step to help support those with spinal cord injuries and other conditions. Customer Specialist Meghan said she found going uphill the most trying challenge, but her personal experience was really moving and brings to light one of the big issues that many living with spinal cord injuries face. “It takes a lot of work just moving around. Without the help of others, it can feel very isolating,” she told us. This is such a big part of why we want to raise awareness. 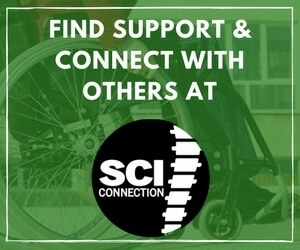 We want those living with spinal cord injuries to know they are not alone! There are support groups and great in-person communities that those with spinal cord injuries can join, and there are activities like adaptive sports, arts, and crafts that many can still participate in, depending on their injury level. This year really helped many more of us realize just a fraction of the challenges that those living with spinal cord injuries face, and we were all happy to do our part in raising awareness. 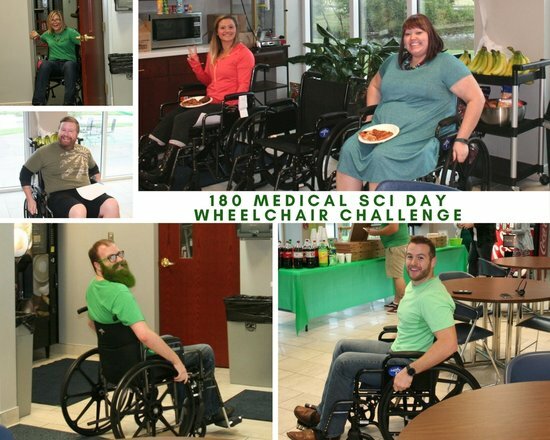 Overall, SCI Day at 180 Medical was once again a fun and educational time that allowed us all a chance to participate and give back during Spinal Cord Injury Awareness Month. Interested in a job with a positive, friendly atmosphere? 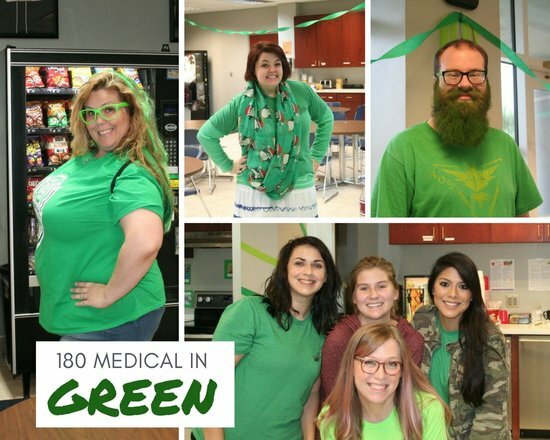 Check out some of the fun we have here at 180 Medical!